Summary: Here is an important article that offers a framework and looks at how genre studies can help writing teachers design meaningful and engaging writing instruction. Fox suggests that standards-based writing curricula do not go far enough when we only teach students about how various genres work. He argues that writing may be construed as “meaningless” and ultimately serve to disenfranchise students if we sidestep the more fundamental question: “Why do people write?” Teachers already familiar with arguments about “authentic” writing will especially appreciate Fox’s call to examine how teachers and students might pursue “urgent” writing situations. An eighth grade teacher in California, glancing at state standards, sees her “job” in writing represented by the following list: research report, simple business letter, job application, persuasive composition, response to literature, autobiographical essay, short story, and technical report. This prescriptive list is typical of what is going on nationally in the standards movement. The movement has largely codified writing instruction into a series of genres that students must master, typically naming forms of writing but not addressing the knowledge required to know when and why to use a particular form. This link between genre and standards is one of the reasons that classroom teachers and researchers in composition have renewed their interest in genre theory. Genre studies, it needs to be said, is a broad area of research with many different perspectives. This article represents my own take on the most important implications of this discipline as, serving as director of the Northern California Writing Project, I work with teachers in my area. The implications are familiar and clear to most of us. Fluency is necessary for students to write, then their writing is shaped into a form, and finally edited for correctness. Writing project teachers in general excelled in developing fluency, even for the most reluctant writers. I also think we excelled at developing strategies for teaching correctness, though students’ editing abilities are notoriously unstable. What we didn’t do then, and still really haven’t done yet, is bring our skill for the teaching of form up to the level of our skills for teaching fluency and correctness. The teaching of form usually varies between two one-dimensional extremes. The first is the simple assumption that once a student develops fluency, the form will follow magically, without much, if any, instruction—the form-follows-content argument. While I believe that the content of one’s writing does shape its form to some degree, this view is too simple and abdicates too much to chance. It does not address the fact that many students with rich understandings of their subject matter have trouble conveying that knowledge through their writing. Some writers struggle with organization and form even after they have mastered their subject. Students’ understanding of forms is critical to their success not just in English or language arts but in the writing and reading that constitutes work in science, history, social sciences, the arts, math, and vocational education. The alternative to the form-follows-content argument is an equally untenable extreme, one, which like a phoenix rising from the ashes of the process movement, is becoming the answer to standards and high-stakes testing: the formulaic approach to genre, common in many for-profit programs. Many of these writing programs take fairly commonsense ideas about writing, such as writing a claim and supporting it, and turn these commonplace ideas into commodities that they sell to schools. Often the formula isn’t necessarily the wrong formula. Instead, the absence of anything but the formula leaves much out of the picture: purpose, audience, research, ideas, risk-taking, the formulation of an extended argument, reasoning, and more. The programs leave so much out that students learn an extraordinarily narrow concept of writing. Though these programs purport to teach the basics, I think they miss the most basic question of all: “Why do people write?” If students don’t understand what writing is for, what it does, and how it can enrich their lives, then learning to write the perfect three-sentence paragraph will be meaningless motion, disenfranchising the exact students we wish to engage. Bitzer’s “The Rhetorical Situation” was published way back in 1968 and attempts to define exactly what the title says. Every utterance—in our case, every piece of writing—occurs in a situation. That situation has an audience, a place, an exigency, a history of similar situations, and a set of “fitting responses” on which the speaker or writer may draw. Those fitting responses we would call genres. For teachers, these would include everything from the friendly letter to research reports to art history critiques to lab reports. The audience, place, and history are fairly self-explanatory. The concept with which Bitzer is credited, and the one that took hold in our group, is the concept of exigency. An exigency is urgency; a requirement for action; a sense that may be ethical, political, or emotional. For example, let’s take this article: I’m in a situation. I know that the audience includes intelligent teachers of writing. I know that my words are being published in the National Writing Project’s The Quarterly and that there is a history and style common to this journal. I can choose to challenge this history or stretch the style, but I know I can’t start writing a letter, a recipe, or a eulogy. It has to be an article. But Bitzer’s concept of rhetorical situation evokes larger issues than the decisions I must make in selecting a genre for this piece. Writing instruction is under scrutiny right now; it is more visible than ever. Teachers, parents and policymakers are looking for ways to engage those students for whom school is foreign, uncomfortable, or a place of sure failure. How can we transform writing instruction from a gate that keeps students out to a gateway for success? Bitzer may help us find answers to this urgent question. Bitzer’s concept of exigency goes beyond choosing an appropriate form and poses a larger question, “Why write?” We write because we are in a situation where urgency requires us to act—to use writing to address the exigency. We write because someone doesn’t know that Lyme disease is caused by tick bites; because someone doesn’t believe that it is important that all people vote; because someone, perhaps even ourselves, needs to know the circumstances that caused the Civil War. In other words, we write to inform, to argue, to learn, to humor, to mourn, to prove, or to choose—among other purposes. …what we learn when we learn a genre is not just a pattern of forms or even a method of achieving our own ends. We learn, more importantly, what ends we may have: we learn that we may eulogize, apologize, recommend one person to another, instruct customers on behalf of a manufacturer, take on an official role, account for progress in achieving goals. We learn to understand better the situations in which we find ourselves and the potential for failure and success in action together…. [F]or the students, genres serve as keys to understanding how to participate in the actions of a community (165). a. Engage the interest of the reader and state a clear purpose. b. Develop the topic with supporting details and precise verbs, nouns, and adjectives to paint a visual image in the mind of the reader. c. Conclude with a detailed summary linked to the purpose of the composition. We have here a genre, expository composition, and some characteristics: a beginning that usually occurs in expository compositions, a middle, and an ending. But the essential element, the exigency or purpose of the writing, is not considered. As teachers, before we direct our students toward ways to engage the interest of the reader and state a clear purpose, we have to engage the interest of the writer in a real purpose. Once the writer feels a sense of exigency, he or she will be able to more effectively meet this standard. My struggle is summaries. I hate writing summaries. I have been writing summaries every day for the last whole year. We write summaries of everything. We write a summary and then we write another summary. If I have to write one more summary, I’m going to explode. My struggle is that I can’t write any more summaries. I’m not worried much about this as a “struggle” essay. Frankly it seems pretty solid. The author has a clear audience (his teacher), a powerful exigency (to stop writing summaries), a commitment to the community (his fellow students), a stunningly effective use of repetition to simulate the experiences of writing too many summaries in the middle section, and a strikingly clear solution. My worry is not about this particular performance; it’s about the droning meaninglessness of all those summaries. When genres get divorced from meaningful situations and powerful exigencies, as in the case with the seemingly hundreds of summaries about which Ryan is complaining, then the students whom we most want to reach are precisely those who are disenfranchised. These are students who are least comfortable in school, least likely to play the games of school, and most likely to believe that school is not connected to a meaningful future. That is why questions of exigency and genre can not be separated from issues of equity. There are areas of tremendous and persistent rural poverty in our writing project site’s service area. While the visual picture of this poverty looks much different from that found in the nation’s urban centers, as I’ve talked with teachers nationally, I see that the experience of children in rural poverty resembles that of children in those urban areas: isolation; violence; drugs (though in my area it’s methamphetamine instead of crack); and finally a feeling of hopelessness, a sense that the future looks much the same, or perhaps worse, than the present. 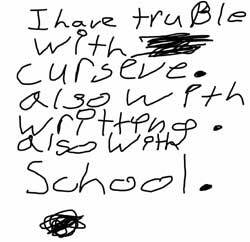 In the short piece of writing in figure 1, one student, Brian, lists a chain of “troubles” that indicate the ways that mastery of writing is linked to a more general sense of success in school. Genre theory has to do with equity precisely because it focuses on the idea of exigency, on urgency. Students such as Brian, who have trouble with school, are typically disengaged, convinced that school is either meaningless or perhaps even antagonistic to them. Some rural poor families become skeptical of all institutions, worried that their values or their families aren’t supported by them. Many have had negative experiences that support their feelings. Writing, for children who live in poverty, has to be a means to address real-life exigencies. If they only learn formulas for genres, if they only learn forms and not their purposes and uses, if they only cover the list of standards, then students like Brian will continue to struggle in school. Similarly, if Brian isn’t taught any forms, anything concrete about genres, he will remain disengaged, convinced that writing is a meaningless act. Both the formulaic ideas of teaching genre and the form-follows-content notion disenfranchise students equally. Students, especially students whose communities are far from centers of power and agency, need to master the genres in the state standards. They need to know how to structure a persuasive letter and an academic essay. We can teach them these with informed and thoughtful pedagogies, using whatever means necessary: models, direct instruction, and maybe even some formulas. But what students need even more than an understanding of how to write a persuasive letter is an understanding of why write a persuasive letter. If we are to see our classrooms and our schools as forces for democracy, then our instruction of genres has to do more than teach students how to write in these categories; it must also help them use writing to participate in the actions of the community. a. Identify the sequence of activities needed to design a system, operate a tool, or explain the bylaws of an organization. b. Include all the factors and variables that need to be considered. c. Use formatting techniques (e.g., headings, differing fonts) to aid comprehension. Keep hands and feet to themselves. This document, written collaboratively by third-graders, uses technical writing wisely to respond to the exigency that a new community of learners needs guidelines to function. To make sure there are no misconceptions, the genre was taught through direct instruction. Students learned that bulleted lists are good for quick readings, that they don’t have to compose complete sentences, and that the list needs to be grammatically parallel. What makes this direct instruction different from formulaic approaches to genre is that it is embedded in a meaningful situation. Note also the ways in which this genre addresses the exigency of a community at risk. Students must “worry about each other” and the teacher must “protect her students.” Linebarger’s teaching of this genre engaged students in a real and meaningful purpose and then helped them master the form in neither a form-follows-content free-for-all nor a decontextualized formula but a healthy mixture of techniques. In the year 2002, I will enter a valve cover racer that will finish in first place. Smooth, sleek, and supple, it will gracefully slide down the track to an indisputable victory. I call it Slick Willy. My final example comes from a Northern California Writing Project summer program called Inquiry Connections, designed and coordinated by Judith Rodby, a teacher-consultant from our site. Rodby recognized that when students are deeply engaged in their subject matter, when they are clear about the use of their work, and when they are involved in the shaping of the purpose and audience of their piece, then they come alive as creative shapers of genre. Working closely with high school technology mentors and teachers, she asked students in this program to select a topic to research, conduct interviews and Internet research, and create a multimedia product—all in one week. Two students, Nextor and Christian, made a documentary about how low-rider cars evolved. They had to research the history of these cars and write the voice-over for the images they found and arranged. Their work, as with all of the student work in this program, showed a sophisticated understanding of both their subject matter and genre. Nextor and Christian’s video demonstrated mastery of several genres, in particular the music video and the scholarly documentary. They implicitly understood how the voice-over works with visual accompaniment in the documentary and knew that documentaries often give historical background. And yet no one—neither the mentor nor the teacher—asked them to produce a “scholarly documentary” or name its parts, nor did Nextor or Christian think consciously about producing a form. Rather they were driven by the exigency of their project. Their knowledge came from their understanding of the social situation and their tacit knowledge gained from reading and living in a media-rich society. Genres are taught best when they are embedded in meaningful situations. Genres emerge from an exigency that varies from situation to situation. The characteristics of genres—their parts—can and should be directly taught but not apart from a meaningful situation or apart from students’ experience of exigency. A thoughtful pedagogy of genres can bridge the gap between disenfranchised students and communities and schools. The National Writing Project is committed to improving the lives of students through teachers’ expertise in teaching writing. NWP prospers because of our restless desire to improve our practice. We challenge ourselves to read more, to critically examine and improve our teaching, to respond to new groups of students with new exigencies as Linebarger, Peasha, and Rodby do. We all need to do a better job of connecting with students like Brian and other students for whom school feels foreign, distant, unimportant, impossible, painful. The teaching of genre, enriched by ideas of exigency and community, is one place to work, to think, and to improve. If we identify genre as embedded in rhetorical situations that spring from exigency, then we stand a better chance of making school a place where the urgencies of our students’ lives can be addressed. The teaching of writing is always a political act insofar as the choices we make as teachers of writing affect students differently. Children who live in poverty need hope, a sense of the future, a sense of involvement, and a sense of agency. They need school writing to be purposeful. The thoughtful teaching of genre—its exploration by teachers of writing—is no easy trick that will transform schools. But enriching our ideas of teaching genre is one part of our steadfast efforts to make schools live up to their democratic promise.